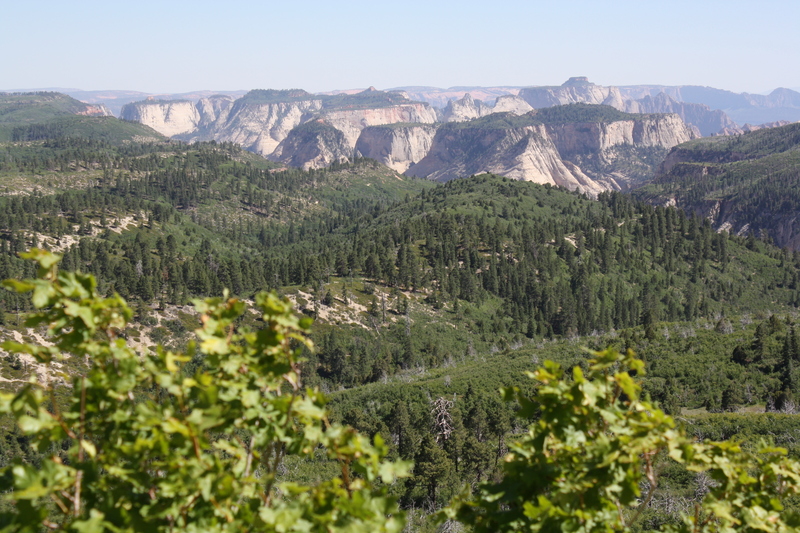 FEATURE – Above the town of Virgin near Zion National Park and away from development and crowds is a mountain community known to locals as Kolob. There one can find the Zion most tourists do not see, perhaps because it goes by different names: Kolob Terrace, Kolob Plateau and Kolob Mountain. Some distinguish its sections by their elevations – “Upper” Kolob and “Lower” Kolob – but most locals just call it Kolob. And for many who have roots in the area or who have spent much time there, the name fits. To them, it is a place where they might feel a little closer to a higher power. The moniker also makes a nice pairing with the name Zion, which means “refuge” or “sanctuary,” whose borders straddle and sometimes encompass Kolob land. These names are exactly how current landowners feel about the place. Landowners make Kolob a little bit of an anomaly for such a scenic wooded area. It is not under Forest Service jurisdiction as one might think. Much of it is private land with the national park bordering it to the south and west. 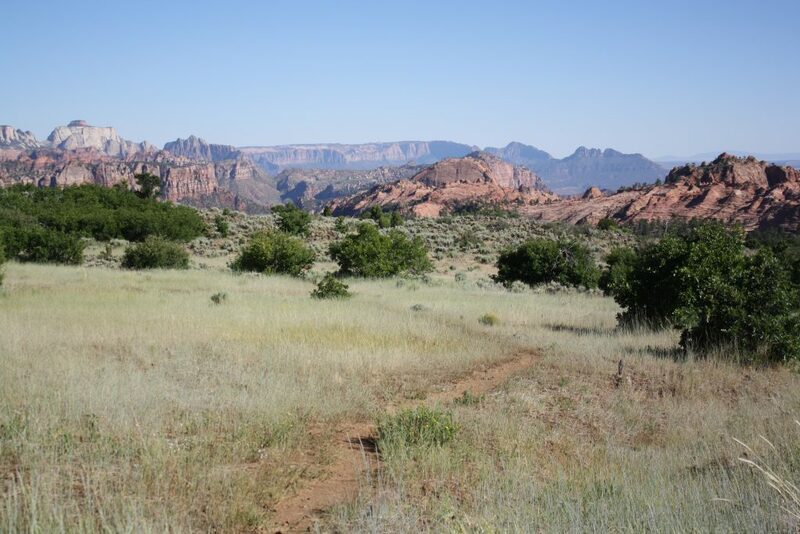 Sections of it are even in the park, such as Lava Point, which boasts a fantastic view of Zion’s monoliths as well as a campground, a picnic area and the trailhead for the West Rim Trail. 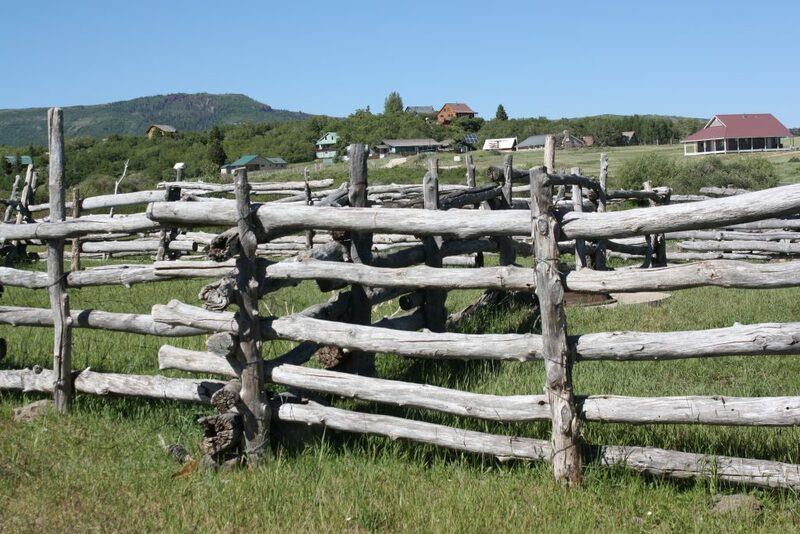 Kolob has primarily been utilized as a livestock grazing area for cattle and sheep since the late 19th century. 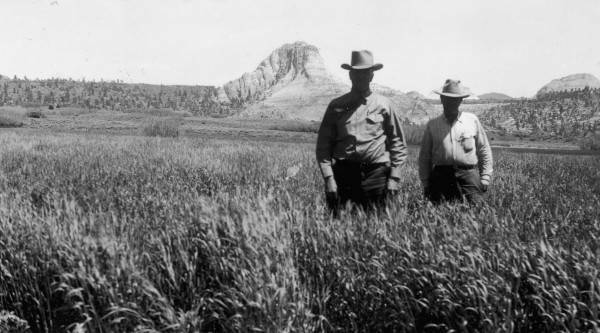 The search for a good summer range led to the acquisition of the land even before Zion became a national park in about 1890. Often, cattlemen would wait until November to gather up their herds to take them to their winter ranges down in the valleys because by then the leaves had fallen, providing them greater visibility to keep track of their cattle. However, taking that risk, they sometimes faced the challenges of early snowfall. In November 1900, the early snow was particularly bad and approximately 75 men from the area had to go and rescue several hundred head of cattle and some horses, which took about 10 days. Thankfully, the rescue had a happy ending. 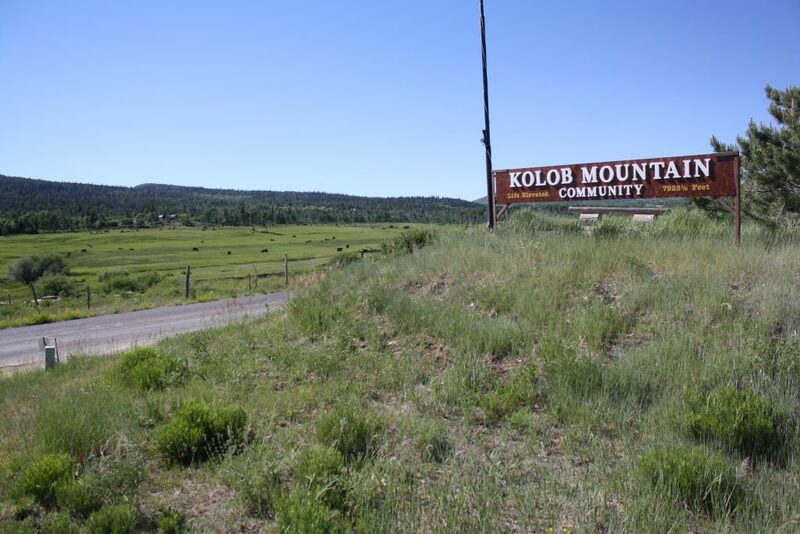 For numerous ranching families in the eastern part of Washington County, Kolob was their summer home. Nephi and Mary Workman, who were one of the first six families to establish Hurricane in 1906, spent their summers in the idyllic spot. Their great-granddaughter Iva Reeve wrote down the story of her family’s annual trips to Kolob. 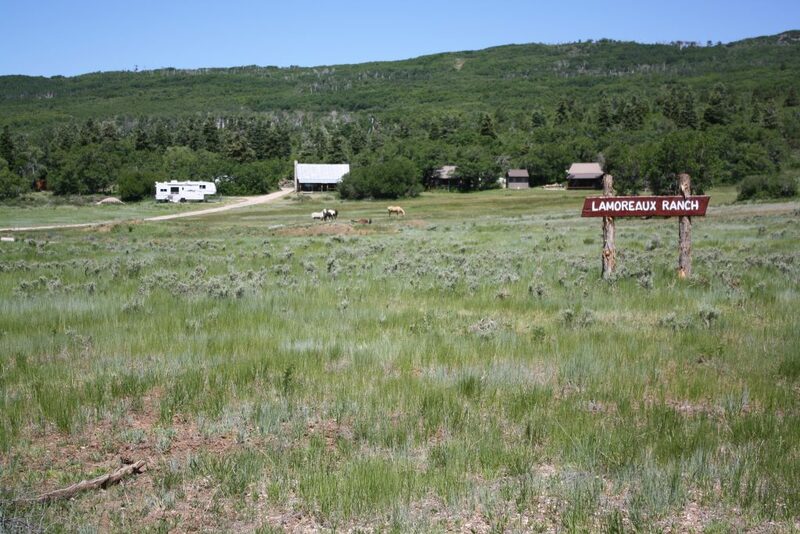 The families left Virgin in the early afternoon and would camp overnight at what was then known as Sanders Ranch or Millville (now Sunset Ranch). The next day, they would travel as far as Lamb Springs where they would stop for breakfast and to water the horses. Then, when they reached a place called The Sandrocks, they had to get out of the wagon and walk so the horses had an easier time pulling the load on the sometimes slippery sandstone. Iron wagon tires screeched over steep red sandstone, horses strained muscle and sinew, pulling, pulling, leaning forward until they went to their knees. Terrified, I watched …. Sometimes the wagon started to slip back and Papa cracked the whip and yelled louder …. With Papa’s yelling and urging, the stout-hearted team made it over the bad spot, where, breathing hard and their hides shining with sweat, they stopped to rest before going on to the summit. The terror was over. When families finally reached their summer ranch houses, it was a joyous occasion. The Workmans’ ranch house was a two-room log cabin with a milk house just a few feet away. There they milked about 20 cows and made cheese and butter, which was a major hit with the sheepherders in the area. Reeve wrote about a time when there were dark thunderclouds in the area. Because the family’s clock had stopped, there was no way to tell time and they mistakenly thought night was approaching. Other than the ranch and dairy work, the families gathered hops and wild raspberries in one of the gulches. Then they’d use the hops in the yeast they made to make the yeast keep longer. 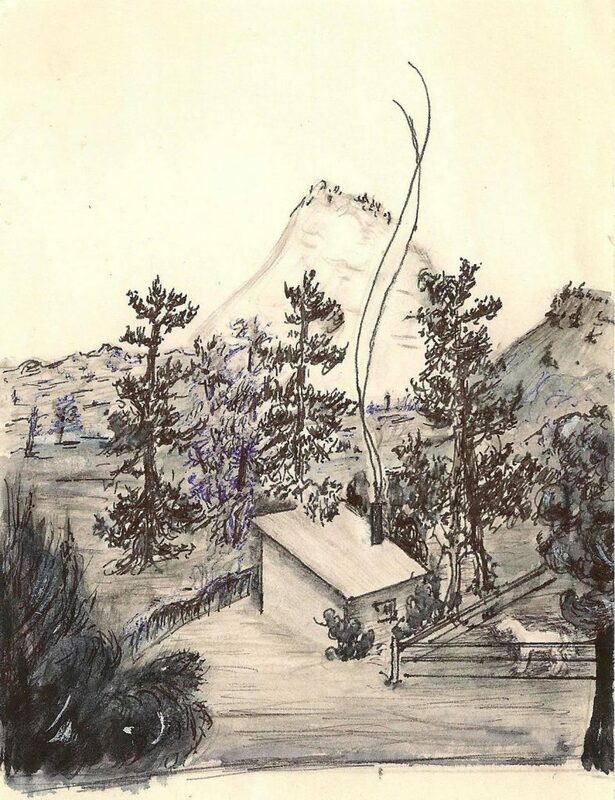 There were about 10 families that lived on Kolob during those summers of the early 20th century. On Sundays they would all gather at one of the ranches to enjoy Sunday dinner together, always with about the same menu – noodles or dumplings cooked into mutton soup. Stratton was born in 1910 in a lumber shack next to a sawmill near what back then was called “Milwaukie,” located just below today’s Wildcat Canyon Trailhead on Lower Kolob. It was the center of modest logging operations for a time. Stratton’s account of her early summers on Kolob includes tales similar to those of the Workmans, her family and theirs being contemporaries. We loved curd, from the first soft white ones to the final squeaky yellow ones after the whey was drained and the coloring and salt added. Probably none of the cheese would have reached the press if Mama had doled out as much of it as we wanted. Still she was generous. Ardean Wright spent his summers as a child and teenager up on Kolob at a later time, in the 1950s. His family raised some of the best grass-fed beef, he said. Each spring, he and his family would stage what he called “an epic cattle drive,” moving approximately 200-300 head of cattle from the Arizona Strip to Kolob on horseback, a three-day journey. That herd of cattle was everything to the Wright family. “What the farm and ranch gave us, that’s what we had,” he said. Back then, Wright said, Kolob was a more serene place. 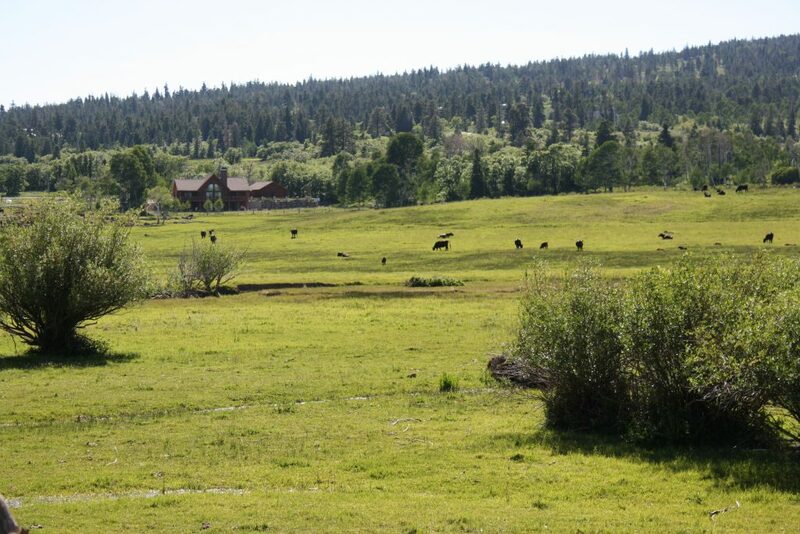 Even though its primary use today is for recreation, summer grazing still goes on in Kolob. In fact, Washington County’s 2010-11 general plan for Kolob said that because it comprises largely privately-held land, the Kolob is advantageous for grazing – meaning the federal government does not have jurisdiction over it (other than those portions included in the national park boundaries) and therefore cannot cut back on the number of animals that can graze there. The Hurricane Canal Company and the Washington Fields Canal Company joined forces with the backing of the Utah Water and Power Board to construct Kolob Reservoir for irrigation water storage and flood control. However, back then Washington County wasn’t the economic entity it is now and the board would not approve construction of the dam unless Cedar City, which wanted to buy into it, was included, said Ron Thompson, general manager of the Washington County Water Conservancy District. With the help of some of Kolob’s ranching families, they finished the earthen dam in 1956 – to a height of 67 feet and length of 686 feet. Cedar City ended up paying for 40-50 percent of its construction costs, Thompson said, and had plans to build a reservoir higher up on Crystal Creek to pipe the water into Cedar City; but that never happened, he said. 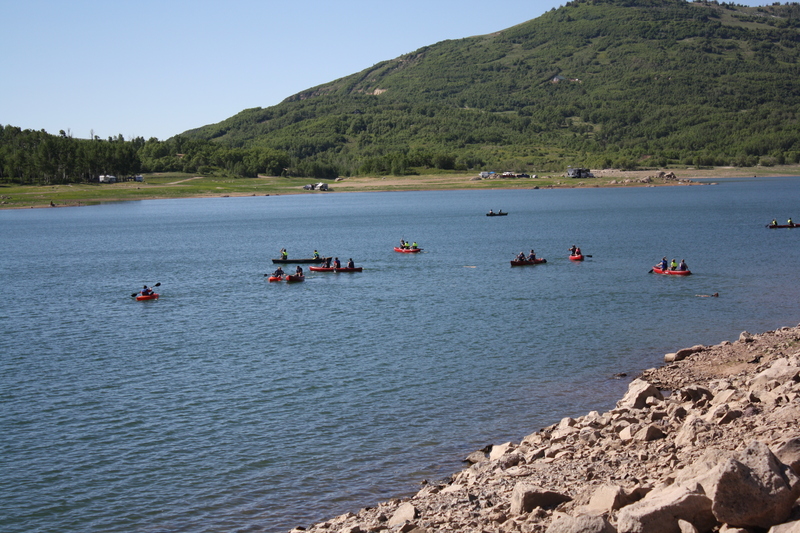 The water district started to manage the reservoir in the 1980s and reimbursed Cedar City for its investment in the reservoir, trading some water shares to make the transaction more amenable to the city. In 1995, the water district purchased the reservoir and its adjacent land, Thompson said. 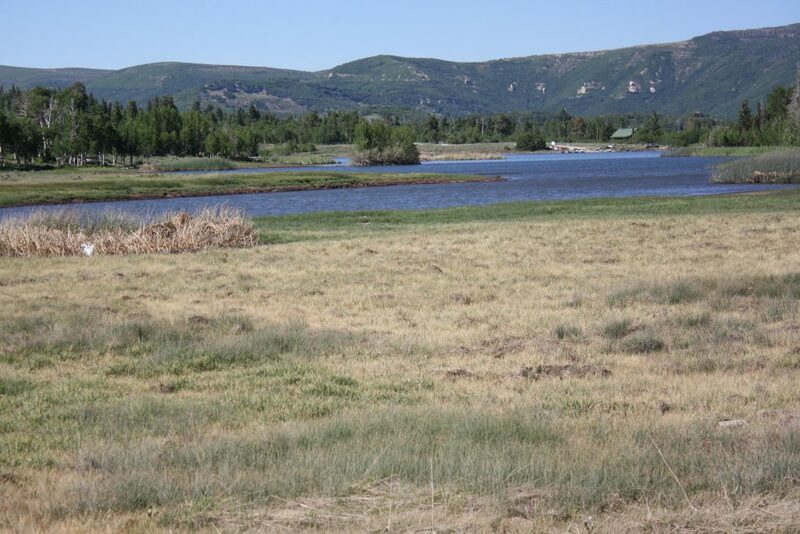 Then, approximately 10 years ago, it built a diversion dam on Crystal Creek to help fill up the reservoir completely since Kolob Creek alone was not an adequate water source. 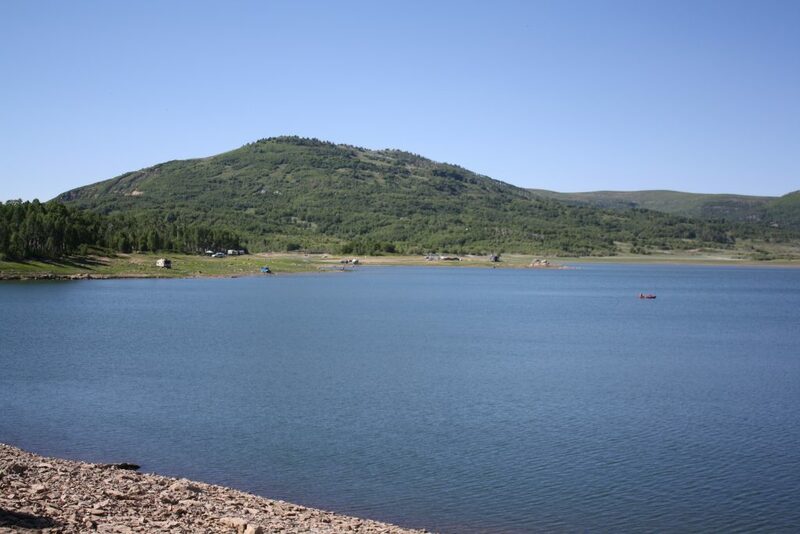 The water district ensures that the reservoir is full in the summer for recreation, Thompson said, noting that most summers it is near capacity but not this summer. 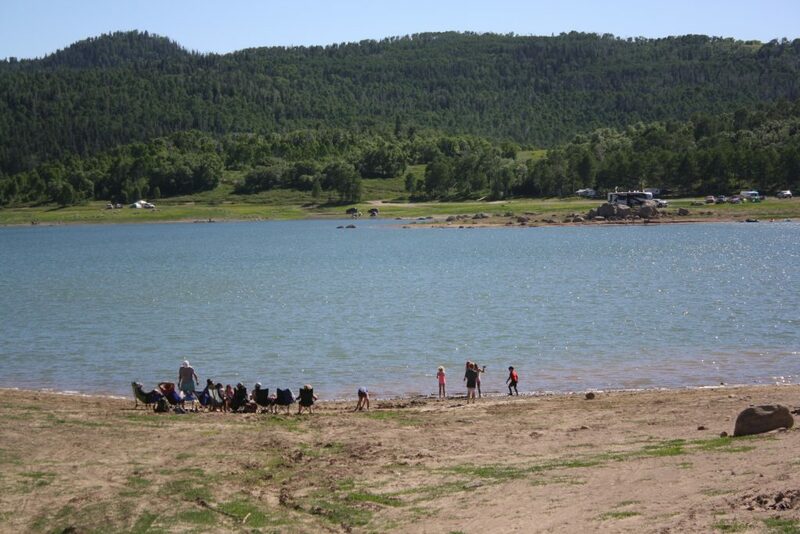 Since Kolob Reservoir is surrounded by private land, camping is only allowed along its shores. Fences mark the start of private land by nearly all of the reservoir’s shores. 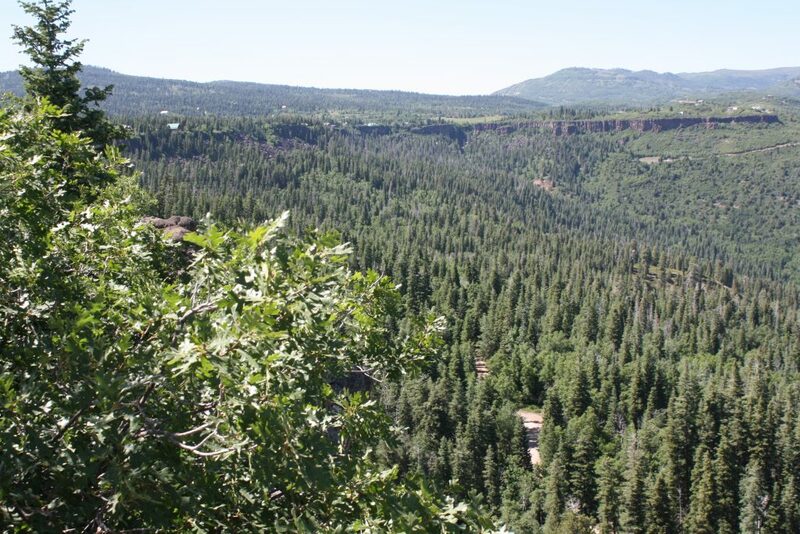 Kolob is an unincorporated area of Washington County with no year-round residents. 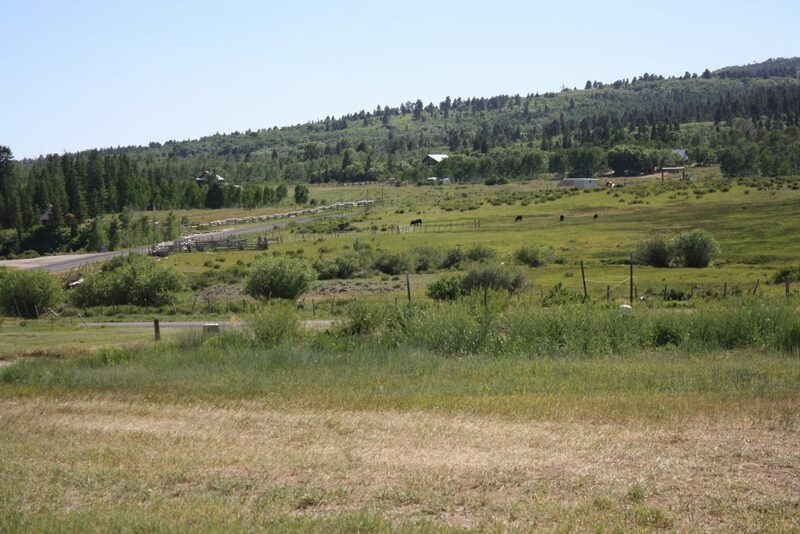 It is still a summer vacation destination, primarily for Washington County and Las Vegas area residents, with many cabins; but instead of serving as summer homes for ranching families, these are now more for recreational use. 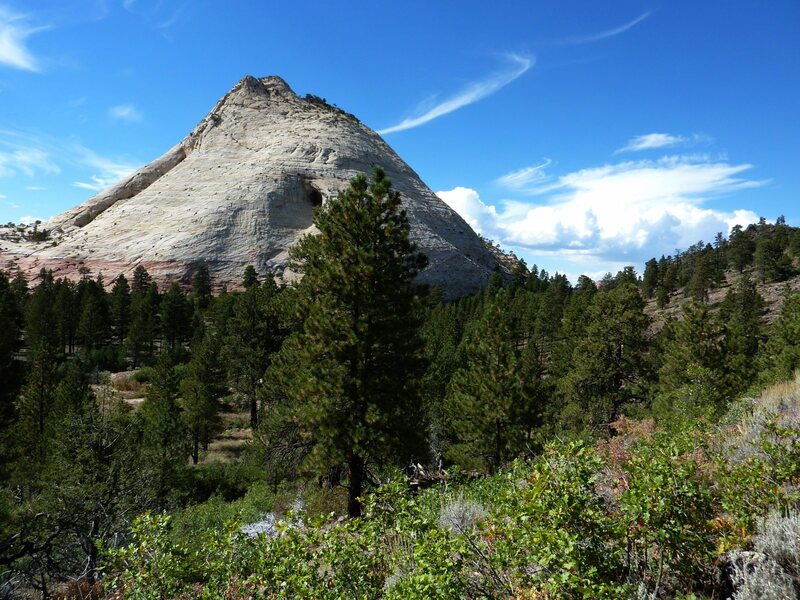 At an elevation of approximately 8,000 feet, Kolob offers its summer residents and other visitors a place to cool off and enjoy unmatched alpine scenery that borders Zion with breathtaking views of monoliths and canyons. 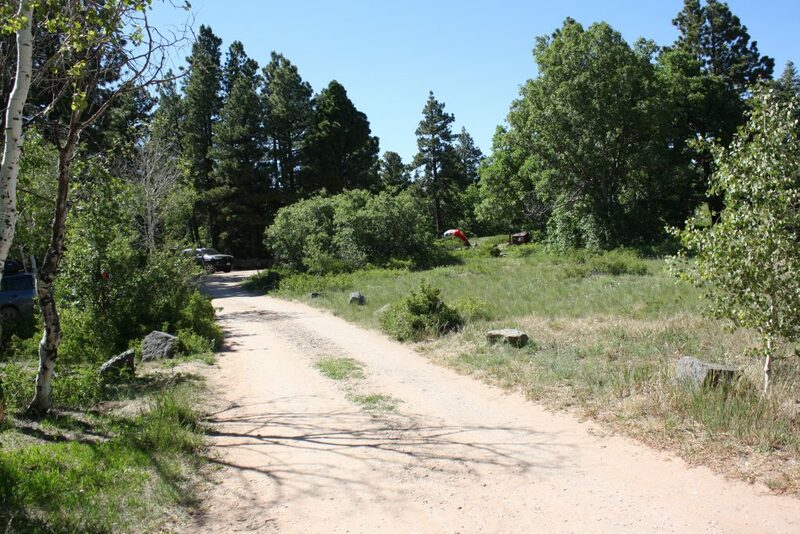 The first cabin subdivision plat on the Kolob was recorded in 1961. Two subdivisions were recorded in the 1960s and seven more in the 1970s. Subdivision development has slowed down since because the county will not approve any more “dry” subdivisions without culinary water lines. However, the water line the water district recently constructed from Crystal Creek provides culinary water to some Kolob locations. Despite its popularity as a recreation hub, there has been minimal commercial development in the area. Years ago, a restaurant opened but did not do very well and was short-lived. A store now occupies the same building and the store has now expanded to include watercraft rentals for those seeking water fun on the reservoir. There seems to always be plentiful chances to buy a piece of Kolob, with for sale signs regularly lining most of its cabin subdivisions. 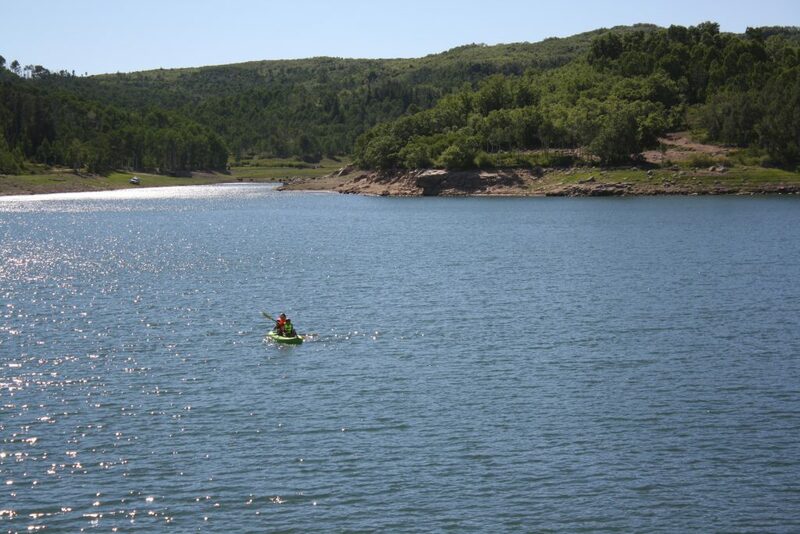 And no matter what one’s fun is while on Kolob, from fishing to four-wheeling, one will want to “hie to Kolob,” as the Mormon hymn suggests, to escape the oppressive summer heat and enjoy the majestic landscape. Kolob Terrace is approximately 57 miles from St. George – an hour and 40 minutes drive – accessed by heading north on the Kolob Terrace Road from Virgin Town along state Route 9. It is worth the drive alone to get there as one will see different scenery of Zion National Park than one would see in the main canyon. The Kolob Canyons section of Zion National Park, which is a different area than the Kolob Terrace, can be accessed from Interstate 15 via Exit 40.